Are Malas a form of garland? Are Malas considered to fall under this precepts or can Malas be worn without breaking this precept? Re: Are Malas a form of garland? Yes to: "Malas fall under this precept" or to "Malas can be worn without breaking this precept?" I can't read whole sentences in Pali. It is the seventh precept in pali. so yes to the former, they do break the precept. Cool! By the way, how can Malas be used as part of Theravadin practice? However, I use them when I am reciting a specific recollection.
" Yes to: "Malas fall under this precept" or to "Malas can be worn without breaking this precept?" so yes to the former, they do break the precept. [/quote]"
I recently did a Vipassana retreat with a disciple of Webu Sayadaw. The main teacher wore a mala which she had been given by the Sayadaw. On the wall was a photograph of him wearing the same mala. Are you saying that the teacher and Webu Sayadaw were breaking the precept ? I think perhaps we need a Pali scholar able to distinguish between a flower garland and a japa-mala. I am sure they exist on the forum. gendun wrote: I recently did a Vipassana retreat with a disciple of Webu Sayadaw. The main teacher wore a mala which she had been given by the Sayadaw. On the wall was a photograph of him wearing the same mala. A Mala is not necessarily a "flower" garland, and the rule does not specify it is made out of flowers. hence the name japa-mala (recitation garland) still applies even though they are not made of flowers. that is no more than trying to get around what they are. do note I did not say wearing malas always break the precept. Different groups understand what is included here in different ways. For instance the male side at Amaravati don't wear malas as a keeping of the precept, yet the women don't necessarily follow this understanding. the same is true for watches where some monks don't wear them due to this rule, yet others do. You need to understand that violating the precept and something being included are not the same thing. Something that serves a practical purpose does not necessarily break the precept yet can be something which is understood as advised against within the precept. a case in point is the watch scenario. Gendun, a plea to authority fallacy is no more than a fallacy. Well as my Vajrayana teacher says "the "appeal to authority fallacy" is itself a fallacy in regards to the Buddha's Dharma ". But in any case I was not making any such appeal. I am new to the Theravada. 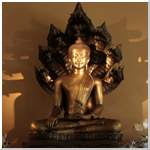 The retreat I mentioned above sparked my interest in the Theravada. I am clueless concerning the Theravada application of the precepts. I was merely pointing out what appears to be anomaly between the absolutist view you gave above, ( which you are now modifying ) and what I encountered in a real life situation with experienced Theravada teachers. Last edited by gendun on Sat Jan 12, 2013 1:47 pm, edited 2 times in total. HERE is the post I refer to. There seems to be no qualifiers here regarding different groups . You state quite clearly that they ( malas ) " do break the precept ". I believe intention is the main thing to consider here. If you are wearing them, not as a means to beautify yourself, but to help with practice, then it seems to me that it is ok... If your intent is to wear just as costume, then that would be breaking the precept. Thank you Billymac thats pretty much what I figured to be the actual Theravada position. As far as the Vajrayana goes of course, malas are virtually compulsory ! Many of us are given one by a teacher and expected to use it for its intended purpose. gendun wrote: Well as my Vajrayana teacher says "the "appeal to authority fallacy" is itself a fallacy in regards to the Buddha's Dharma ". Well fallacies can still (and do) happen. What some anonymous Vajrayana teacher has to say about them is not really relevant. You were making such an appeal here by calling for someone who “knows” what they are talking about to clarify without knowing my background with pali or monastic settings, while pointing out what you thought was a difference between mala in the pali and malas being discussed. Providing further information is not modifying anything. As the question stood to malas being included in the precept they clearly do, hence it breeches the precept. This is a matter of fact regarding their inclusion. Not dealing with the interpretations some may or may not have. But what does your real life experience mean here? gendun wrote: HERE is the post I refer to. There seems to be no qualifiers here regarding different groups . I knew what post you were referring to as you quoted it earlier. I am solely dealing with the rule not interpretation. Last edited by Cittasanto on Sat Jan 12, 2013 3:00 pm, edited 1 time in total.